#1 Practice better self control. Being intentional and mindful about what and how you communicate is essential to a successful sales interaction. Whether you are excited about what the prospect is saying and are tempted to interrupt and pre-emptively share your solutions or simply trying to negotiate a better deal, the patience and stamina that come about with meditation will give you the upper hand. #2 Approach a sales meeting feeling calm and collected. Even the most seasoned sales reps get the jitters before an important sales call or at a critical junction in the sales process. Meditation reduces existing stress while preventing additional stress from taking up space. Don’t blow off an important sales opportunity because you have to blow your nose. For all of you road warriors out there doing business in a sea of germs, meditation will help you protect yourself by strengthening your immune system. Cold & Flu prevention aside, a regular meditation practice can also prevent chronic diseases that could compromise your sales stamina. #4 Become a better listener. THIS. 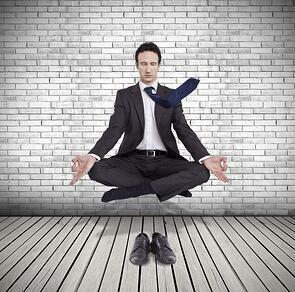 If you have no other reason to consider meditation to improve your effectiveness at sales, this is it. Modern sales methodologies rely on less closing and more helping. This means less talking, more listening. Meditation will help you develop the mindfulness to be present in your sales conversations so that you can focus effectively on your prospect’s needs. #5 Set and manifest clear intentions. Are you focused on hitting a specific sales quota? Of course you are! Visualization during meditation is a very effective tool in creating the focus and subconscious behaviors that you need to achieve your goals. #6 Learn how to manage your energy. The modern sales superstar is an ambivert, which means that today’s sales reps may find meetings with prospects to be energy draining, rather than energy gaining. That’s why it is so important for sales professionals to understand how to manage their energy throughout the day. Midday meditation provides the opportunity to clear the mind and re-energize. Ready to get started? My favorite resources for a quick mediation are the Stop, Breathe & Think App or the Stress Free with Deepak Chopra album.